This beautiful natural Red Garnet Marble Urn is perfect for any home or office. Just like the garnet gemstone, red garnet marble can vary in its coloring and can include shades of pink, purple, and burgundy. 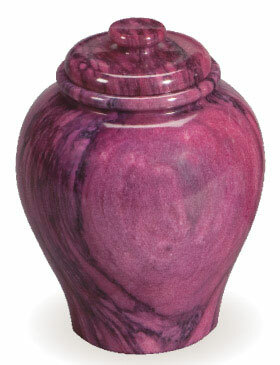 Most urns tend to be more dark pink in coloring than true red. Marble is an elegant and beautifully natural way to remember your loved one and it comes in three sizes to accomodate. The keepsake is perfect way to give a memorial to others in the family who want to keep their loved one close. As with any natural stone, there will be color variations between one urn and another in the same marble, making each urn unique. Please view other shades of red garnet urns by clicking on the tab titled Detailed Images. 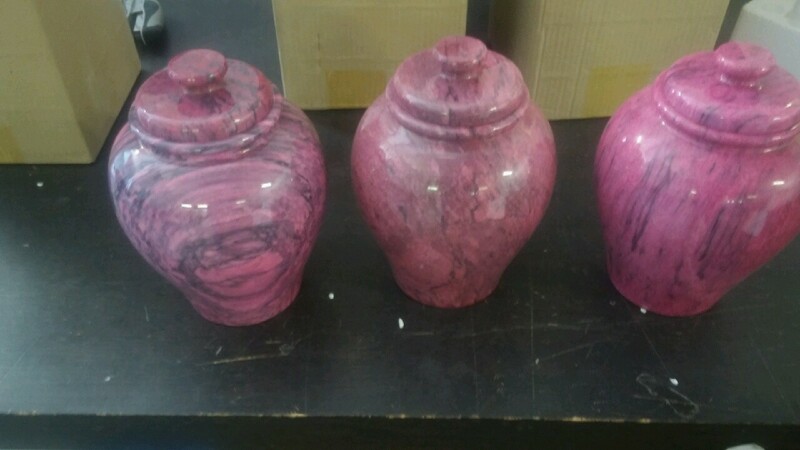 You will note that one urn has more pinkish tones in the marble. Red garnet marble can have various shades of pink, purple, and burgundy. Computer monitor color settings vary and may show these urns darker or lighter than the actual color. We cannot guarantee the urn you receive will be a specific color in the red garnet color field. We will be happy to send you photos of two different urns to choose from. Adult Size: 8" Dia x 10.75" H - 230 cubic inches. Keepsake Size: 3.25" Dia x 2.25" H - 3 cubic inches - opens on the bottom and seals with a plug. Engraving: We offer optional custom engraving on this product. Please click on the Detailed Images tab to view the available fonts. Our engraving department will choose the best location for engraved text. Length of text lines may be limited by the size and design of the urn you choose. As a basic rule, please limit engraving to no more than 32 characters (any letter, number, punctuation, or blank space) per line. Please call us with any questions at 800-511-0295. Ships same day if order is placed by 12pm Pacific Time.